Mexican President Enrique Peña Nieto will find himself among friends when he greets the president of the United States and prime minister of Canada at the annual North American leaders' summit in Toluca on February 19. 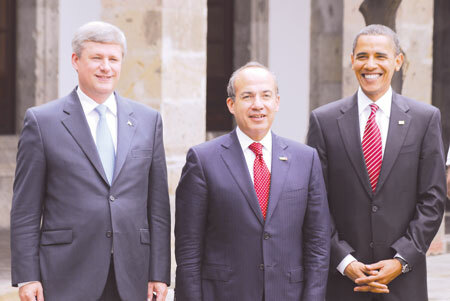 The administrations of Barack Obama and Stephen Harper have both reacted positively to Peña Nieto's wide-ranging reform program, designed to speed up development in Mexico and help the nation reach its global potential over the next decade. Although the rules of the energy sector reforms have still to be worked out, many U.S. companies are expected to invest heavily in a more open Mexican energy market. White House spokesman Jay Carney said the February meeting – Obama's fifth visit to Mexico as president – will include discussions on security, economic competitiveness and trade and investment. A side issue at the meeting will be the immediate future of the travel visa required for Mexicans visiting Canada. Although Harper recently said that it "would be in the interest of both countries to get rid of the visa," he suggested the unpopular measure is unlikely to be scrapped until additional immigration legislation is passed by parliament. Business and tourism leaders in both countries have criticized the visa requirement, which was introduced after a spike in the number of phony refugee claims by Mexican citizens arriving in Canada. However, the Globe and Mail recently called on Harper to use the trip to announce the end to the visa requirement and restore good relations with Mexico. In the editorial, the paper said while the measure had dried up the bogus refugee claims, the cost has been way too high.